ESILL, the Eastern Shore Institute for Lifelong Learning, located in Fairhope, Alabama, is a non-profit organization offering a unique program in adult education. It presents two terms of courses each year, in the fall and again in the winter/spring. There are no prerequisites, requirements, tests, marks, or credits involved. ESILL was conceived as continuing education without unnecessary pressure. Its philosophy is learning for the fun of learning. 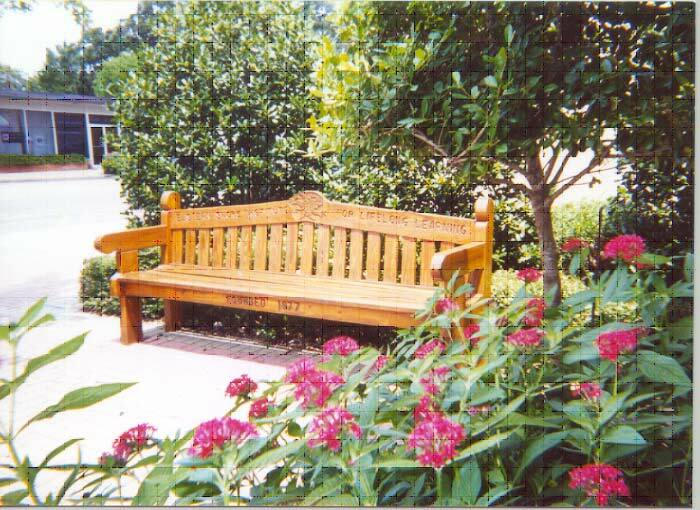 The Eastern Shore Institute for Lifelong Learning’s Memorial Bench is located in the courtyard of the Fairhope Welcome Center on Section Street. Crafted by ESILL supporters George Hind and Stan Hodgin, it was installed and dedicated to the memory of ESILL founder Dr. Donald Lester in 1997. ESILL was the brainchild of a retired clinical psychologist, Donald M. Lester. He believed that intellectual stimulation and continuing development were the ingredients of a long and enriched life. Lester was sure that a healthy retirement was not the time for mental lethargy, but was the very time to make time for mental pursuits often put aside for business and family responsibilities. In May of 1977, he got together with other retirees who he thought would be interested in forming a unique school where they might teach freely, offering subjects not likely to be found in more traditional institutions. His vision was to create a school "...where learning is for sheer excitement and satisfaction without the stress of bucking for grades, degrees or certificates. And to provide retired teachers and lay scholars the opportunity to teach what they want to teach without having to fit their courses into some Procrustean bed of departmental and curriculum requirement. To teach for the joy and reward of sharing one’s enthusiasm." The idea was intriguing, and the group enthusiastically agreed to give up any sort of "traditional" retirement and provide time to instruct others with like interests. That meeting saw ESILL’s birth, and ever since, it has continued to offer a strong, individual curriculum. Pioneering adult education on the Eastern Shore, the Institute has remained independent, and not affiliated with any other educational body. It is free to accept the teachers who will provide stimulating and intelligent courses – capable and enthusiastic people who may or may not have academic credentials. In 1987, ESILL received a Commendation from the Alabama Gerontological Society, presented by Governor Guy Hunt of Alabama, that cited the Institute for its "provision of intellectual stimulation" and for creating "an opportunity to share learning and educational concerns". In just ten years, ESILL had established itself as a model for providing opportunities for the retired to teach and to share their life experience. After Donald Lester’s passing, his wife Lee, who served as President of the organization, said, "ESILL will always honor the memory of its founder by continuing to serve the community with excellence". A volunteer Board of Directors governs ESILL and is responsible for decisions and regulations affecting operation. The board solicits teachers and courses and sets the curriculum. No board member receives remuneration for administration of these duties. Instructors receive a small honorarium in appreciation of the work and time put into the preparation and instruction of their courses. ESILL courses are conducted in classrooms made available primarily by churches, libraries and Senior Centers in Fairhope, Daphne & Foley, although occasionally other classroom space may be used. Apart from audio/visual equipment, ESILL has no physical assets, resulting in low tuition rates. For over 30 years, ESILL has remained vibrant by regularly introducing new courses and by locating qualified new instructors. As indicated on our Home page, life experience, not necessarily academic credentials, is the primary requirement for teaching at ESILL. We solicit course suggestions from our students and from the general public in newspaper articles, and then endeavor to find a qualified teacher to introduce the subject to our curriculum. Alternatively, we are approached by individuals who wish to instruct. As a consequence, we have a long and rich history offering interesting courses that provide learning, offer discovery and foster self-renewal. It is gratifying that some ESILL courses have had a lasting impact on our students and even led to splinter organizations that champion the arts. Our Mountain Dulcimer course (an original American stringed instrument originating in Appalachia) was first taught in 1994. It spawned a number of dulcimer groups in the community. The annual Stan Hodgin Dulcimer Festival (named after the ESILL instructor who started it all) draws participants from all over the U.S. More recently, the ukulele has come back into popularity, and ESILL's Introduction to Ukulele course has resulted in nearly 60 local players, a large Ukulele Club that meets regularly in Fairhope, and a ukulele ensemble that performs locally. ESILL's many and varied art and craft courses have added to the local art culture as well, with some students and instructors participating in the annual Fairhope Arts and Crafts Festival, named one of the top shows in America. These are just a few examples of the courses offered by ESILL. Other educational opportunities have included beekeeping, ham radio operation, French, Spanish, Italian, and German language study, literary topics from poetry to drama, fiction and nonfiction, creative writing courses, self-help skills such as estate planning and self-defense, cooking, and history. The list goes on, growing from the wealth of ideas, skills and talents available in our community.